In early March Stro Elliot was kind enough to come into Melodics HQ while on tour down under. In just one afternoon Stro created a new Melodics lesson from scratch named ‘Eggs on Toast’ and even spared some time to do an interview with us. The conversation was full of amazing insights as Stro delved into his life as a musician and his unique approach to music production. Tell us the story of how listening to Pete Rock growing up turned you into a finger drummer by accident? When I started making and listening to beats I assumed that producers played all their drums at once. I thought this particularly when listening to how Pete Rock’s music sounded. He had such a loose feel, it sounded like a drummer was playing the drums even though I knew they were samples. So I’m listening to what he is doing and I’m assuming that he sat there and played through the whole track. Like a drummer would on a drum kit but on pads. So I taught myself how to play drums on pads. This is the way that many people see me play drums on pads now during my live shows. I later saw a video of him (Pete Rock) in the studio and watched him program drums one finger at a time, one sound at a time. I then realised how he really did it and was like ‘you have got to be kidding me’. Fast forward to a show I had the honour of doing with him about a month or two ago. When I met him we did the set and he watched me perform and he said “yo that is really bugged out the way you play the drums with your fingers”. I then told him the story. He said “oh that is really crazy, but now you have this great tool that is in your favour and you can use”. So all in all it was a headache in the beginning but at the end of the day I guess it was all worth it. That is pretty incredible how you went from listening to Pete Rock to performing with him. Who are some other heroes of yours, that you have had the honour of working with? I was in a hip hop group called The Procussions and we had a chance to open for a lot of our heroes. A Tribe Called Quest being one of them as well as Redman, Methodman, De la Soul, The Roots. We almost checked off everyone in terms of people we wanted to open for. In the last year or two I have had the honour of getting to meet these people and have spent a considerable amount of time with them. Working with The Roots in the studio for a week and Electric Lady out in New York. Meeting the guys from De La Soul, Jazzy Jeff and a few others. It has been a real blessing to be able to collaborate and pick the brains of some of my heroes. Has spending time with your heroes become a new normal for you? I don’t know if it is normal. I tell my friends that I have known for years, that there are these moments when you are around people who you revere and you forget that they are super heroes. I have a couple friends at home, that I will spend time with. We’ll hang out, watch sports, go out to eat and it’s not until I’m in the studio with them or a show, that I remember that oh yeah this guy is Superman. I’ve been hanging around Clark Kent all day, but I forget that he can fly and can see through walls. Do you think that learning to play live gives you a better understanding of how to make beats than sequencing? I don’t know if it gives me more of an understanding than it does inspiration and ideas. The same way a live band will improvise a song they play a million times live, I will do the same when performing in a live set. You know I may have created some piece of music, but when I’m performing it, I might get a different idea. Like this would have been cool if I did this in the original recording. So it gives me ideas if I want to go back and change some things if I haven’t released the track, or provide ideas of things I can apply the the next time I make something with a similar feel. So whether it be a little fill in here or a little switch up there, I can now apply this to the track I’m making. That way I think it’s more about being inspired and motivated to expand on what I’ve already done. So through playing live you are able to generate a catalogue of ideas in your mind faster that can be applied to future tracks? How does finger drumming affect your workflow in the studio? For me it definitely enables me to get the idea out faster. You don’t have to stop every four bars or every eight bars. You can kind of just do what I call have a ‘jam session with yourself’. I will play around and be like okay that’s a cool sequence or chord structure, lets add a bass line to it, then I will just have a jam to it (on the pads), until something feels right or good over that track. Otherwise it would take me longer as I would have to sit there with a kick, a snare, a hi hat and if I do not like it I would have to repeat that process. As opposed to being able to play to it, until something feels good. When I watched you ‘jam with yourself’ I saw the Ableton Session had three minutes worth of MIDI from you playing drums. From there is it a matter of going through what you played and taking the best four to eight bars? Yeah exactly that. I will find a section that fits. Sometimes it will not be exact but it will be close. Then it will a matter of me replaying it or physically drawing or shifting things around until it feels the way I want it to feel. Technology. I read in a past interview that you know how to play piano, guitar, trumpet & drums. Is that true? The first instrument I was actually taught to play was the trumpet. Which was in middle school. This was because it was less noisy than drums for my parents. However my parents probably regretted that as trumpet is not very quiet either. I played it for 4-5 years. My father being in the military meant we moved to Germany for a while. Due to moving around a lot I did not have all my papers at the school. So they had no record of the instruments I played previously. So when the teacher asked me what I played I said ‘drums’. I figured this would be my chance to finally play the drums. By the time he figured out that I played trumpet he gave me the choice between drums or trumpet. At first I chose trumpet but eventually went back to drumming after more of the other students left. After this my mother bought me a keyboard when I was 16. I was self taught with that instrument. I learned primarily through first learning a few chords and then learning by ear. I liked Jazz Fusion stuff and early soul, from their I would analyse the songs I liked and pick apart the chords that I wanted to play. The guitar I was given by Granddad at around the same time. I spent a summer with him in the Midwest and found his guitar in the basement, he never used it but said it was a gift from a friend. I kept picking away at it, but it only had three strings. So to this day, what I know on Guitar is very basic. But I feel like I can thumb around on the guitar enough to get the idea out if needed. As a kid that was what I was into, I just wanted to get my hands on anything that made noise. Anything music related. What influenced your passion for music at a young age? Was it a certain moment or person? There was just something about music. I come from a family that is not musical. No one in my family played anything or sang. There are members of my family who are tone deaf, and can’t dance. So I was definitely the odd ball that came out of nowhere. However my parents knew I liked music and continued to play music as I grew up. But it was probably not until I was much older that they realised how serious I was about it. I’ve always felt like, without getting too deep that there must be a God because there is no reason for me to have this strong a desire to make music without anyone in my family playing music. I’ve always found this interesting as most of the musicians I’ve met come from pretty musical backgrounds, either their parents played or had a group friends they came up with that played. So you have a big interest in music, you are learning a lot of different instruments. What happens next? Because I was such an introvert as a kid, my parents and family did not recognise my passion for music until a lot later. I didn’t share it with anyone. They knew I liked it and would ask them for instruments, however they didn’t initially realise it was something that I would want to turn into a career. It was not until high school that I got active about it and found other people to play with and started doing things in talent shows. Those opportunities came from people I met at school or summer jobs. We would get together and jam, which kind of set a trend for me to find people that were artistic or created music and try to create a vibe from that standpoint. So how long was it until you went from playing music at high school to touring with The Procussions? It did take a minute. It was about three years until I met the initial members of Procussions. We had met before that but it was more of a hobby. They knew I messed around but it was not something we started to take serious until about 98/99. We came up with the name and started doing shows together and that has snowballed into a career. And you have been on that trajectory since? Absolutely that has been my whole life every since. I have never really had a Plan B for myself. Much to the worry of my mother. She is very happy and proud of what I am doing now but there was a period where her and my father did worry. No one wants to have the Bohemian kid that bounces from couch to couch and any doesn’t have any sure income and that whole scenario. But I think for myself knowing that I had no Plan B, forced me to find a way to make it work. This was the reason why I connected so much with another member of the group (The Procussions) Mr Jay, who is doing the same thing now and has many different outlets. I think we were the two people in the group that did not plan for anything else. This made me take things more serious and be grateful for the opportunities that have come my way. Yeah. There was a time I had really huge hair, soul patch hanging from my chin. After the group disbanded initially I was down and out. I cut my hair and got a real 9 to 5 for a minute. I worked for GUESS Jeans in Los Angeles. It was more or less a customer service type role, I answered phones and helped people with their orders. However the odd thing was I got fired during my training. I was like “who gets fired during their training. I’m learning to do the job and how could you get fired for learning”. But afterwards I had a very interesting conversation with my brother, I remember ranting and raving “I can’t believe they fired me. Here I am trying to do the right thing, trying to get my life together, getting a legitimate job, cut my hair and this happens”. Interestingly my brother was actually really mad at me he said “I don’t feel like that is what you are put here for, this is not was your calling. Everyone else can get 9 to 5’s but you are made for something more than that. So whether that means you got to work harder on the music thing or create a different circle of people around you. There needs to be something more you can do.” It turns out he was right. Did you switch up your approach after this? I did. It happened slowly. But the way I did it was treat my passion for music as a 9-5 job if you will. Making sure there was a certain level of productivity everyday, whether it turned into something or not. I went through the motions of making music and hitting certain targets. In relation to finding the right people, that happened more organically. I decided to go out in LA more, meeting more musicians and participating in different circles. The Procussions would eventually start working again and put out another album, but even in with that happening I would continue to be a working musician and connect with other like minded people as much as possible. They say a lot of the time in the industry that ‘who you know’ is more valuable than how talented you are, and I would say that has served me well. I’ve got a lot of opportunities based on my relationships with people and that is something I continue to do. I feel like I continue to create these opportunities to meet people who are influential but also just good people. So we can hang out outside of music as well. What would you say to someone who has been inspired by your videos, bought a controller and are just starting? I would be honest and tell him that the biggest thing in music for me was being a really big listener. I was nerdy in the essence I would read every line and note, I would watch people. Now days that is a lot easier than it was back in the day. There are a lot more resources with Youtube at people’s disposal to do this. So I would probably start there. Watch the people who are doing what it is that inspires you. But it is important to start from the standpoint of listening. Because as much as I would be honoured that someone would like to make music like me, it is also much more important that people develop their own style and sound. Just as I was influenced by someone and took it to a different place, I would hope this person starting out would do the same. Today you made your first Melodics lesson. I was privileged enough to watch you make it from scratch. Can you tell us about the lesson and give some pointers on how to play the lesson? Well it was good that I was given guidance on the tempo. Because I often feel I would struggle to be a teacher. I tend to start at Level 5 without releasing I need to teach Level 1-4 first. Initially I was like I would make something in odd meter time and just go nuts. But being given the number of 100 BPM was helpful as it gave me a vibe to start. While working through it chord wise I knew I wanted to make something that was simple to follow, but still felt good and that allowed me to be open with the drums and the way they are played. I knew going into it that if I made something a bit too muddled up, a lot can be lost in translation about what is going on with the drums and the rest of the music. With that said the overall process centered around making something in my own style that was simple but still interesting for people to play. Could you give a brief description of the way that you layout your drums on the pads? Well it is interesting in this particular lesson you get to see where I came from and where I am at now. In the live video you will see I have a lot tighter set up, with everything bunched together. Which came from the fact that I used to use the MPD pads from Akai that only had 16 pads. The pads were much bigger so it did not feel as tight. So with the initial part of the video the pads are arranged in this much tighter set. You know you have the kick right next to the snare, hi hat next to the snare, a clap above that and maybe what I call a snare ghost note under the snare. Now what I have found is that I have been able to open up my set up. On my live kit, you will see that I have the hi-hats on the outside of the pads. The kicks and snares are all below that as well as the toms and the cymbals and all the other bells and whistles on top. It kind of mimics the way I play the drum kit, you know having things in a open flow, even though it is me using two limbs instead of four. I like being comfortable and having a flow of feeling like I can go anywhere from the hi hat standpoint. So my set up being hi hats on the outside, kicks and snares below allows me to sort of have a natural flow with my two fingers. Do your finger drumming skills help with other instruments when you are producing tracks in the studio? I had an instance about a week ago. Where I was helping a friend of mine by laying down some guitar. I noticed that I did feel a little bit looser, than the previous times I had played on guitar. I remember there were a couple licks, where I was like that’s surprising, I couldn’t do that before. So maybe unconsciously there could be a benefit to me utilising my fingers more through playing with the pads. This could be potentially opening up the way I play keys as well as guitar. So there may be a connection there. I hope there’s more music ahead in terms of creating it and playing it live. As of now that seems to be the case. I have always liked travelling and there’s already plans for more shows stateside and potentially overseas, so I am really excited to be doing that. Hopefully I will be releasing a new project by the end of 2017 as well which would be cool. Need new sounds for your production library? Well you are in luck. 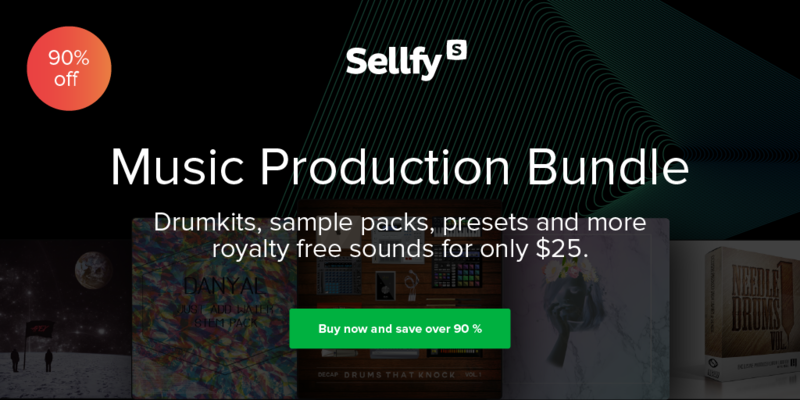 Our friends over at Sellfy present the Sellfy Music Production Bundle. Including premium sounds from Decap, Evil Needle, Danyal, Brightest Dark Place, Juku and Steklo Acapella this bundle is essential for aspiring producers. All these products come with Sellfy Music license, which means everything inside can be used completely for your creations. This pack is usually priced at $260 but is currently available at $25 for a the next 24 hours. After months of requests we are proud to announce that our brand new feature Courses is here. 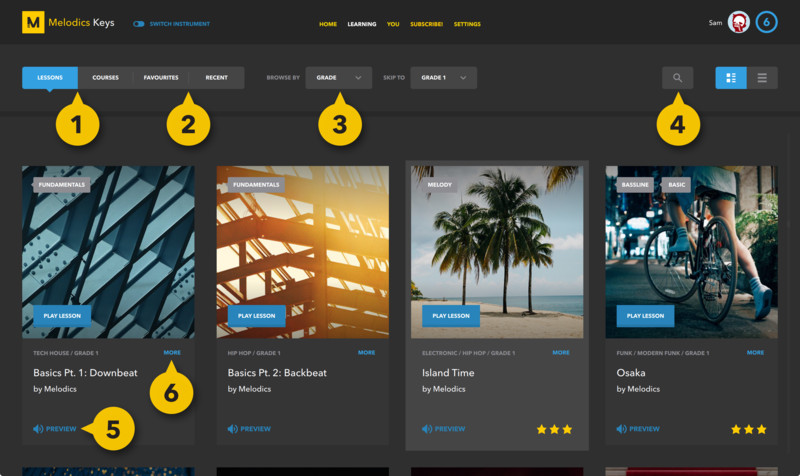 Courses are curated paths through Melodics lessons – covering genres, techniques, musical concepts, and more! 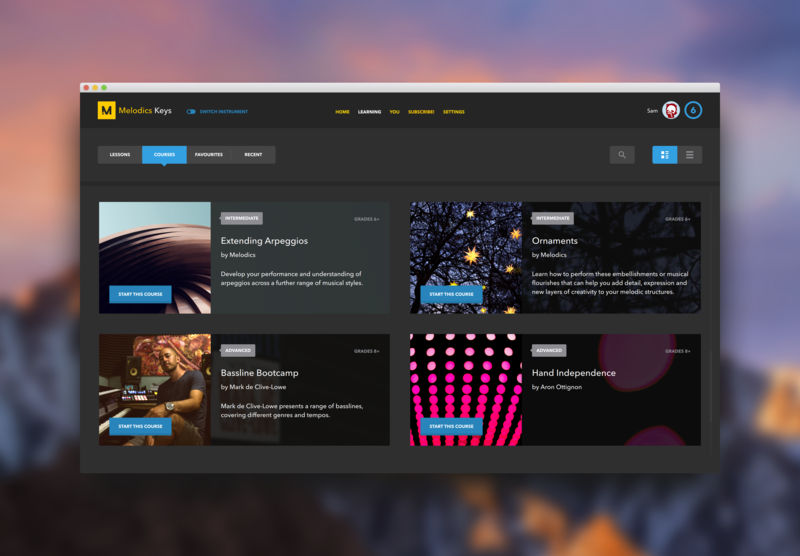 We think that this new addition will give users a new way to structure their learning and build skills faster. 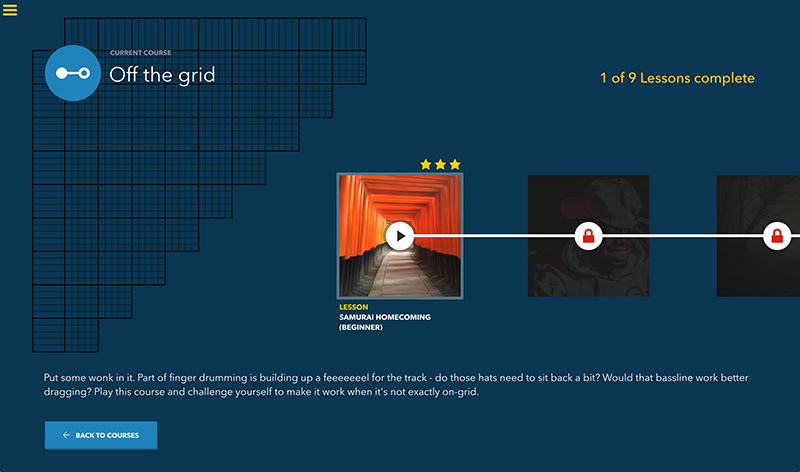 Get started with Melodics & finger drumming. This course will lead you through a selection of our free content, covering a range of genres & techniques. Start growing your skills, get a feel for what you like… and what you need work on! The realness, the foundation. Take a short trip through Hip Hop history covering breaks, boom bap and soulful beats. From break sampling, golden-era boom bap, and neo-soul, through to future beats, trap, and more – play your way through Hip Hop’s history in this course. Separating your hands & fingers to play complex arrangement is a huge turning point in getting better at finger drumming – this course walks you through lessons which allow you to build this necessary skill, skipping between genres, BPMs, and exercises. Put some wonk in it. Part of finger drumming is building up a feeeeeeel for the track – do those hats need to sit back a bit? Would that bassline work better dragging? 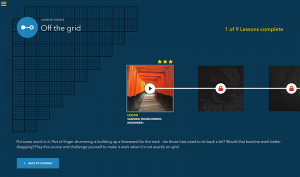 Play this course and challenge yourself to make it work when it’s not exactly on-grid. Flip tracks, create dramatic build ups, and take your DJ set next level. Cue Point drumming is taking off with mixers like the Pioneer S9 and NI Z2 becoming increasingly popular – build the skills you need to master this surprisingly difficult technique. This is only the beginning with more courses scheduled to arrive in the upcoming weeks. If you have any ideas for a course let us know via the Feedback section in the Melodics app. In our second ever instalment of Beat Breakthrough we talk with San Francisco based producer Decap. When it comes to making beats Decap goes way back making his start at just 13 years of age. Find out about three beats that have shaped Decap’s progression as a producer. What is the oldest or one of the older beats that you can find? Tell us the story behind it. I made this beat in the summer of 2000 at age 15 when I started getting serious about making beats. I made the drums in a really old version of Fruity Loops and recorded the sample chops on my Boss SP-202 into Cool Edit 96. I can’t remember the exact sample, but it was off a record I bought at a local flea market. A beat that represents a turning point in your production career? I made the skeleton of this beat in 2014 in like 10 minutes. I ended up releasing it as a single in 2015 (after spending 3 months tweaking it), alongside a video of me performing it on Push with Ableton. I feel like this track helped solidify my solo music career. A transition from behind the scenes producer, to artist and live performer. The latest song or beat you are most proud of. And why? Play Decap’s brand new Melodics lessons entitled ‘Samurai Homecoming’ now! This week Melodics has released brand new lesson Future Bass lessons called ‘Aurora’. 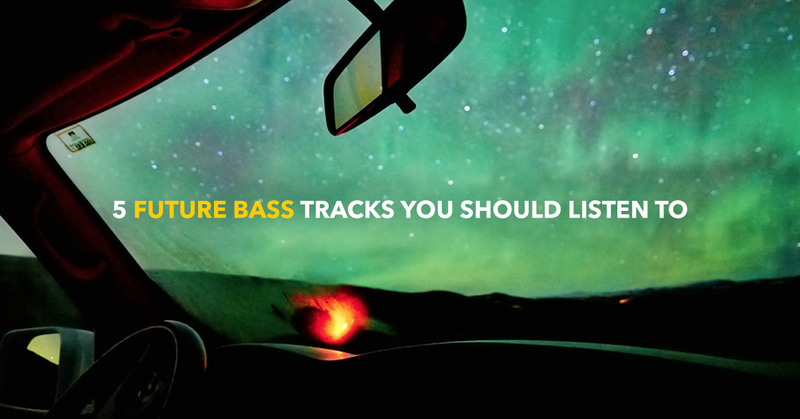 To mark the occasion the team has decided to share five future bass songs that we rather like. With one of the best producer names in the Future Bass scene, Lindsay Lowend dropped GT40 three years back. Hayden James with the original and ODESZA on the remix. Doesn’t get much better than this. Sango has made numerous collaborations with singers and rappers in his short career. His LP with SPZRKT entitled ‘Hours Spent Loving You’ was a masterpiece. Norwegian producer Cashmere Cat ascended into prominence in 2013 with a string of popular remixes. Since then he has gone on to collaborate with The Weeknd. A future bass list would not be complete without a song from Flume. The Australian producer continues to grow, with his signature sound heavily influencing the next crop of future bass producers. Had to add in an extra tune from Sam Gellaitry. At only 17 years of age this Scottish producer shows it is never to early to make amazing music. Want to learn the fundamentals behind making Future Bass beats? Try our brand new lessons ‘Aurora’ available on the Melodics Software.